If you are throwing a St. Patrick's Day party, than you need to check out all of these St. Patty's Day party ideas. 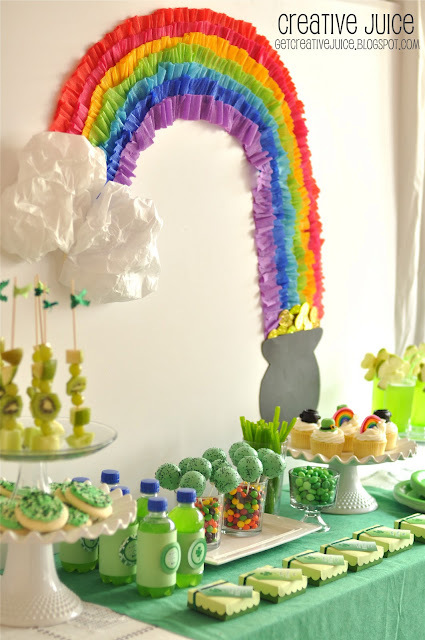 Everything from the green fruit kabobs to the ruffled streamer rainbow backdrop. Take away the pot of gold and that rainbow is great for a birthday party. You can see all of the info on this St. Patrick's Day party over at Creative Juice. That is adorable and looks like it would be fairly easy to pull off to. :) That's the best kind of creativity! That is way too cute! Even the little green fruit kabobs to the left, everything is perfectly green!